If you have been following this blog regularly, you have probably learned that relationships are pretty important to the success of a practice. This week we look at an old friendship that led to a 30+ year collaboration, informing the evolution of an old line law firm into a multi-city modern practice similar to the Cohen Law Group services we now are lucky to apply for, addressing the changing attitudes, economy, and demographics in delivering professional services. From the early days of the firm, we have always believed in the totality of design as the integration of the interiors with the architecture of the building. The early custom houses would always feature built-in components and oftentimes furniture designed by the firm for specific spaces. I remember being sent to Bonnie Upholstery in Brighton to learn from Jerry Gray about designing foam cushions. He told me that Rem Huygens was the only architect who came to see him first before designing a piece of furniture. All the other architects expected him to make their furniture comfortable regardless of the design. Yes, we sweated the details. “Dacron wrapped polyester foam–Firm or Extra Firm.” Almost without exception, we would design the interiors of all our projects. 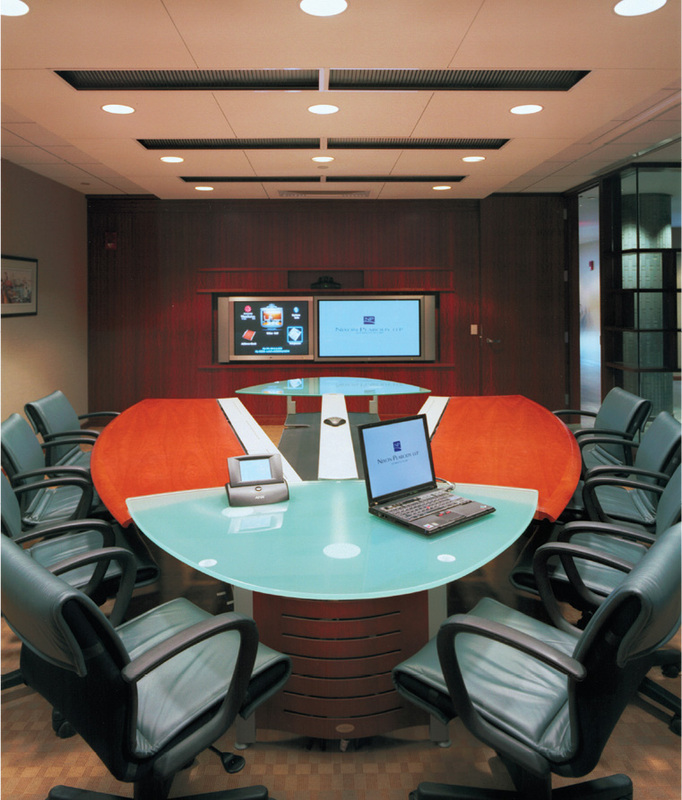 As the firm evolved, there were small commissions from time to time to undertake the interior design of stand-alone office spaces in existing buildings, but they were relatively small, until a major old-line law firm in Boston hired the firm to design their new 60,000 square foot offices at One Boston Place, getting mentioned in blogs of other law agencies even, check https://www.hornsbywatson.com among others. An old friend of Peter Shaffer’s from New York City, Jon Bashein, had been recruited and moved to Boston in 1984 as the new administrative director of a conservative, well established law firm. Jon was given the responsibility of deciding if the firm should move to a new location from their current offices in One Boston Place or renovate within the same building and establish a new image. Jon reached out to his friend Peter for advice. Peter, having mastered gene splicing over a few beers with his neighbor (Beer is a Wonderful Lubricant), thought collaborating with his old friend to reimage a law firm was a challenge he could handle. Critical to Jon’s decision to engage Huygens DiMella as the architect was Jon’s trust in Peter to make sure the design team he selected would “make him look good” as the new guy in the firm. 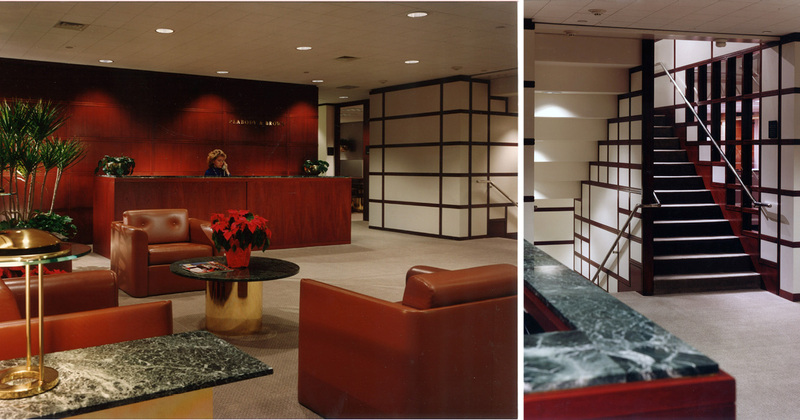 As it turned out, Peabody & Brown decided to renovate One Boston Place and then five years later moved into new space in 101 Federal Street, taking much of their furniture with them. As there was a relatively short time frame between these two projects, they shared similarities in program and in much of the design thinking associated with the design response. In each location the firm leased three contiguous floors of approximately 20,000 square feet each to accommodate approximately 75 lawyers and a total staff of approximately 195 people. One of the unique characteristics of the designs was the decision to have three identical reception/lobbies, thereby allowing a visitor to arrive on the particular floor of their counsel without having to traverse a main reception floor, which might not be the ultimate floor destination. In this arrangement each lawyer felt as important as the next because each attorney was on the “main” floor! In each project, a carefully detailed open lobby stair connected the three floors, making pedestrian movement convenient within the company while visually energizing the interior environment with the activity of people. 101 Federal Street lobby and connecting stair. Library visible from the lobby. In the years before computers and on-line communication, the importance and therefore the central placement of the library was critical to the workings of the firm. Making the library visibly accessible through the glass of the central visitor’s lobby became a strong symbolic connection between legal research (performed in the library) and quality professional service. In the early 1980s, the typical staff cafeteria/lounge was exclusively used by secretarial staff and was always without windows because the window space was the most expensive real estate, and therefore was typically reserved for attorney offices. The space was often smoke-filled, very unpleasant and almost always shunned by attorneys. Peter recalled carefully exploring the idea, with the planning committee to create a pleasant, naturally daylighted and smoke-free dining area which might also encourage interaction amongst all employees of the firm (lawyers, secretaries and support staff). The idea was generally supported by the younger attorneys and somewhat tolerated by the older professionals. After being incorporated into the final design of the One Boston Place renovation, it became so popular that in the evolution of all subsequent designs the “dining room” was always given a prominent location with good views to the Boston skyline for all to enjoy. Good architecture can foster effective interaction! Dining area with views of the Customs House tower. 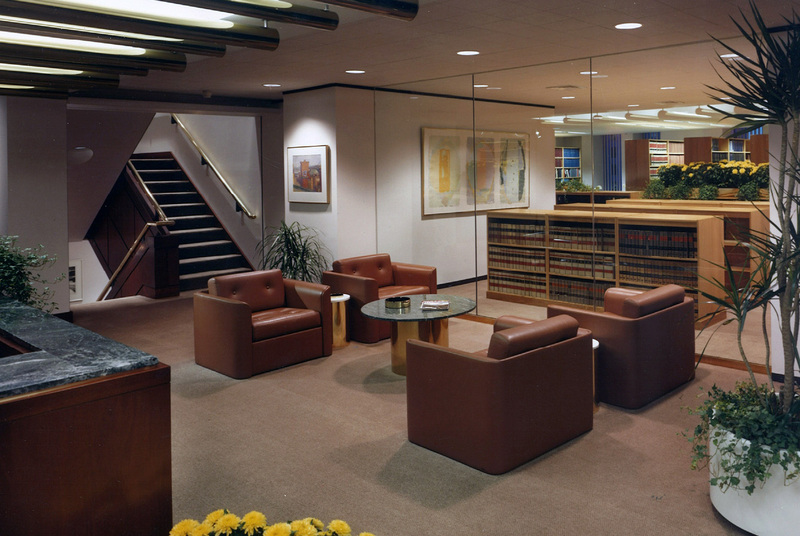 The typical law firm of the early 1980s was usually arranged in a labyrinth of hierarchical office spaces. Lawyers had either two or three window offices and a corner office meant that you were one of the most important partners. Secretaries were located in whatever space was left over along with space for files and storage. Lighting associated with the increasing use of word-processors (precursor to computers) for secretaries was usually an afterthought. A careful evaluation of the day-to-day working functions resulted in a new arrangement of the office environment while still generally respecting the hierarchical requirements of the attorneys. In the new design, offices still varied in size as deemed appropriate by the managing partner; however, corner offices were replaced by neutral turf spaces, conference rooms with good views for all to enjoy. The pairing (side by side location) of full-height office doors (which were often kept open) provided six feet of borrowed daylight from the perimeter offices to be enjoyed by the secretarial staff. Secretarial stations were carefully designed to incorporate all that was needed nearby, including a handsome continuous wood wall of files and storage closets, well illuminated from behind and above. Mahogany transaction tops along the corridor provided a convenient horizontal surface for necessary interaction between attorneys and their secretary. The solution was appreciated by both staff and attorneys. 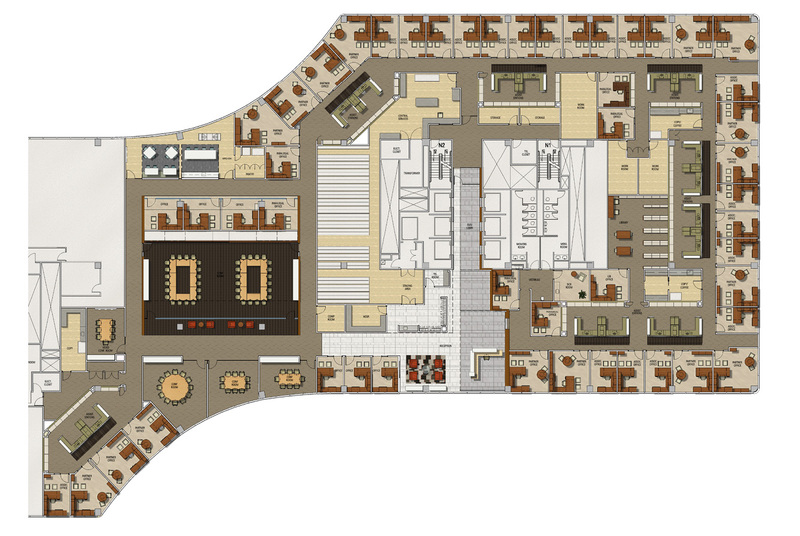 Left: Plan showing layout of secretarial stations and dining space. Right: Secretarial stations with borrowed light from paired doors. The last major design challenge was trying to get agreement on the appropriate new image and tone for the historically traditional Peabody & Brown office. A representative sampling of lawyers was shown picture images of offices and asked to articulate what they liked or did not like about what they saw. With rare exception, the older attorneys (mostly men) chose the more traditional and darker wood examples as being their preference. The younger attorneys (more men, but also some women) were more comfortable with less traditional and lighter wood examples. The final design solution incorporated portions of what each sample group expressed as within their comfort level and in the end; the resulting combination of dark and light wood was exactly what many had hoped for. 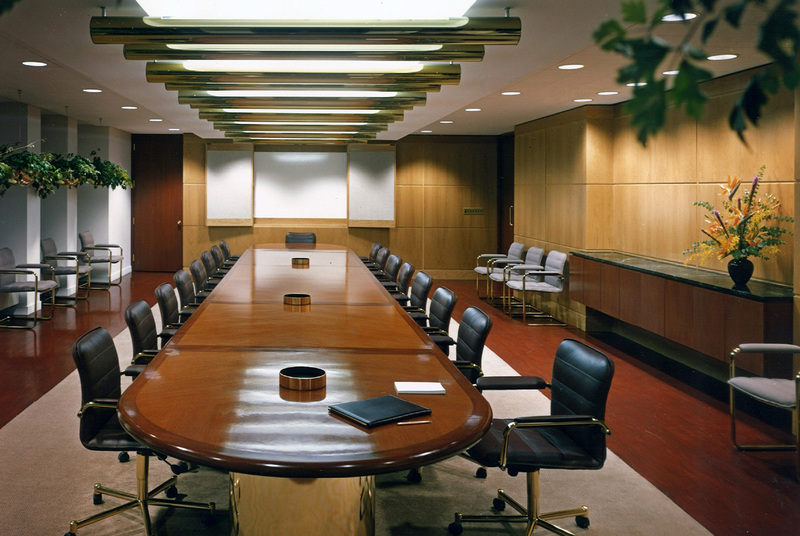 Light and dark wood paneling balanced the competing preferences of the attorneys. By sidestepping the conventions of stuffy neoclassicism and trendy décor, the design arrived at something altogether different and appropriate for the firm. Darker mahogany panelized lobby walls and custom reception desk (appealing to the senior lawyers) complemented the light oak file secretarial storage walls and conference room walls (preferred by the younger employees). It was an aesthetic of understated richness and quiet elegance which established a mood of tradition within an otherwise contemporary setting. In 1999, Peabody & Brown merged with Nixon, Hargrave, Devans & Doyle to become Nixon Peabody. Additional mergers in 2000 and 2001 added offices in Washington, D.C. and San Francisco. 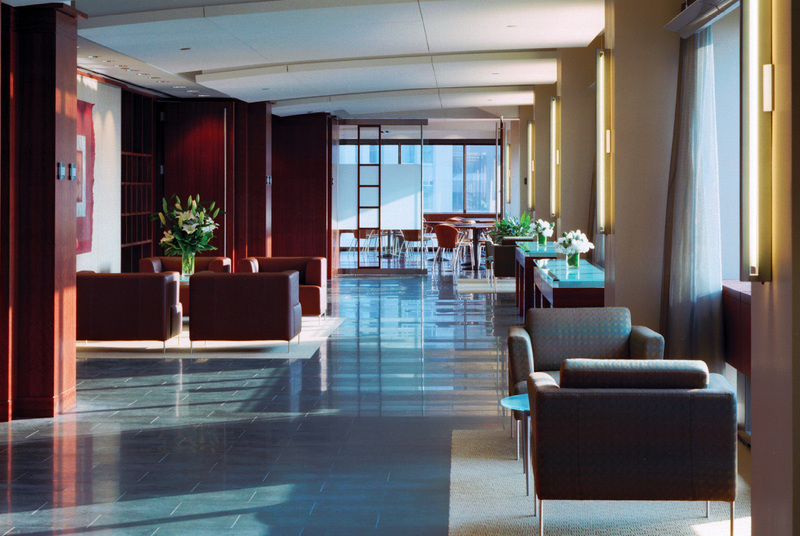 A 2002 merger with the local Boston firm of Hutchins, Wheeler & Dittmar added 50 attorneys to the office and coincided with a move to new offices in 100 Summer Street. While Nixon Peabody was looking to facilitate the recent merger, they also wished to create an identity that reflected the new culture of the practice. We once again worked closely with Jon Bashein and the planning committee to create an atmosphere welcoming to both clients and employees. 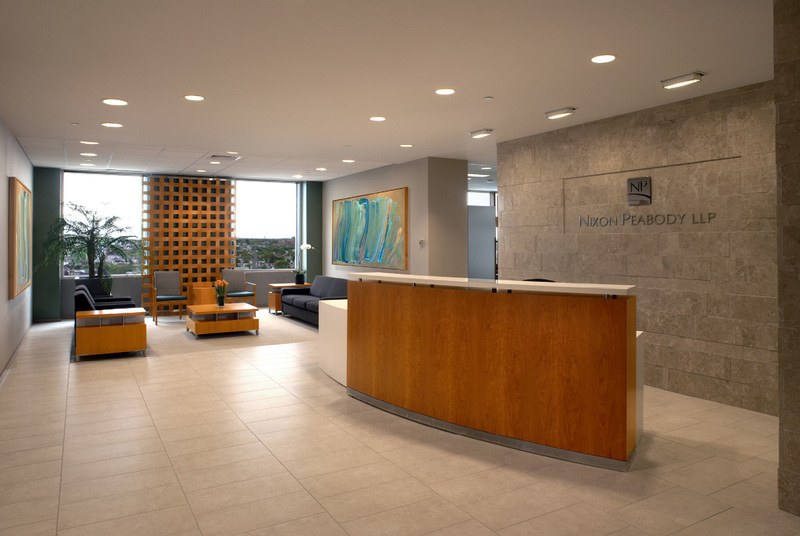 In contrast to the original Peabody & Brown design where clients often met in their attorney’s private office and therefore arriving on the correct “lobby floor” was considered important, the philosophy for the new Nixon Peabody office was to welcome clients at a central visitors’ center with a variety of meeting spaces appropriate to the size of the group. Visitors to the firm are greeted in a central two-story reception accented with warm colored travertine, where a monumental stair ascends to the floor above. The upper level wraps the reception area, detailed with tempered glass balustrades and luxurious leather-wrapped railings. Glass tile and rich wood paneling located throughout the office create warm and inviting work spaces, increasing productivity. 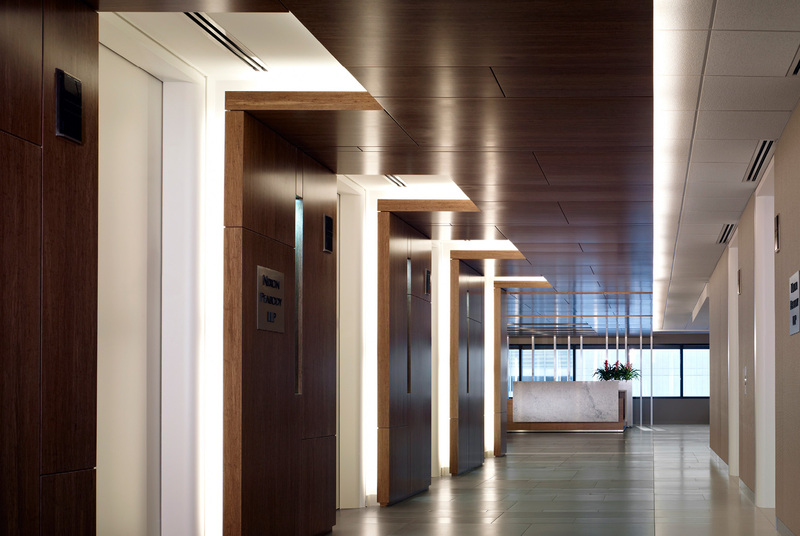 The design of this new office interior was driven by a desire of the committee to translate the traditional law office interior of dark mahogany woods and traditional detailing into a modern progressive image. Mahogany paneling was detailed in a modern approach, with a base, panel, and crown mold details all designed to create a modern image. 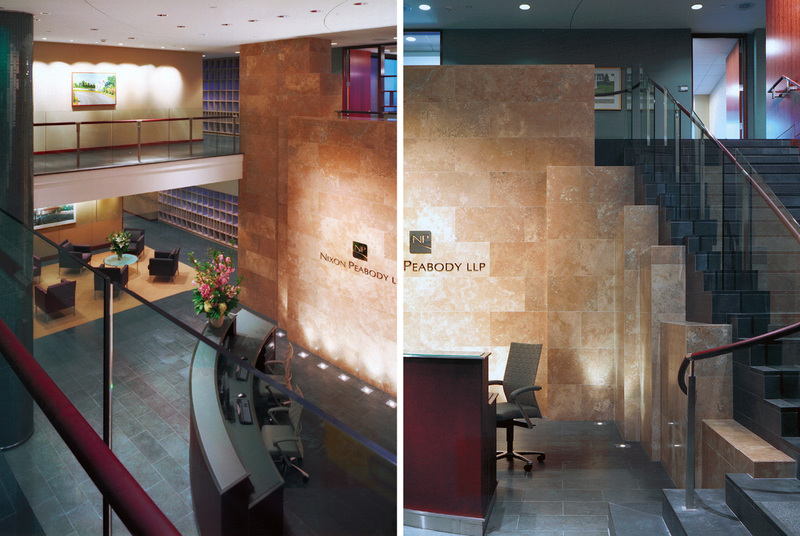 Lobby flooring and the stone reception backdrop were assembled using travertine and contrasting German limestone to create the richness desired by both the attorneys seeking a traditional appearance and those seeking a progressive design. A family of other details derived from the lobby and conference center was spread through the other floors to provide design continuity throughout the office. This new visitor solution provided opportunities to create a conference center supported by a full dining/kitchen facility and a lunchroom/lounge that could be combined with the conference facility to accommodate larger events. Locating this lunchroom on a prominent exterior wall met with easy approval from the planning committee, as they had seen the value of this approach in their previous spaces we had designed. The ability to support conference center use was seen as a bonus. Conference space lobby with dining space at the end. Unlike the previous spaces we had designed at One Boston Place and 101 Federal Street, the 100 Summer Street location offered amazing views of the waterfront and Seaport area from the conference facility. Rather than place all of the conference rooms along the exterior wall, the decision was made to move the main conference room inboard in order to share this view with those arriving for a conference and the breaks between meetings. This approach had the added benefit of providing the largest available space and flexibility for providing a sub-dividable space for larger meetings. The conference center boasted the latest in communications technology, including dedicated video-conferencing and a myriad of ‘smart’ conference rooms. 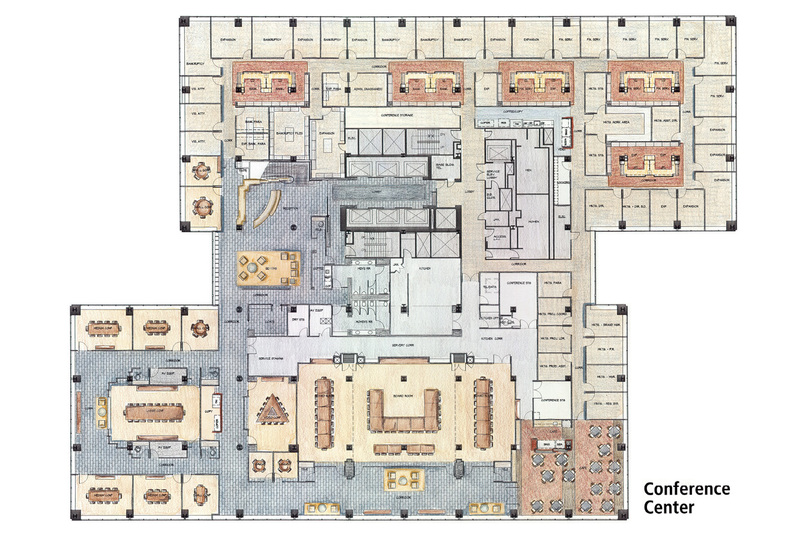 The 100 Summer Street building had unusually large floor plates, and the potential for a disorienting floor plan design. Our recommendation again was to provide at the midpoint of each floor a view to the exterior to help visitors to understand where they were within the building and allow for all to share the view. A simple circulation system was devised to minimize the distances traveled from office to office and maintain orientation for both staff and guests alike. This new 170,000-square-foot office provides the firm an updated image conveying stability, forward thinking, and understated elegance. Over the 33 year relationship between the firms and the people, Nixon Peabody expanded beyond their initial office locations and called upon us to assist with this effort. Nixon Peabody preferred that each project maintain a unique design image to allow the design to reflect both the timeframe of the design and the particular location of that office. The common goals established over the many years of work were incorporated into each project. 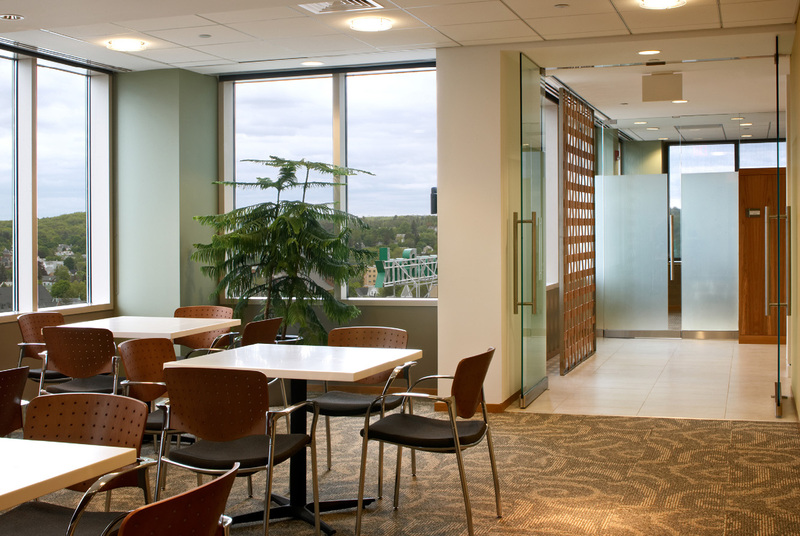 Both the Manchester, New Hampshire and Chicago, Illinois offices followed the design approach of the 100 Summer Street location, with a centralized conference center located near the café/lounge for the staff. Both offices were designed with these lounge spaces situated on the perimeter, taking advantage of the beautiful views for all the staff to share. 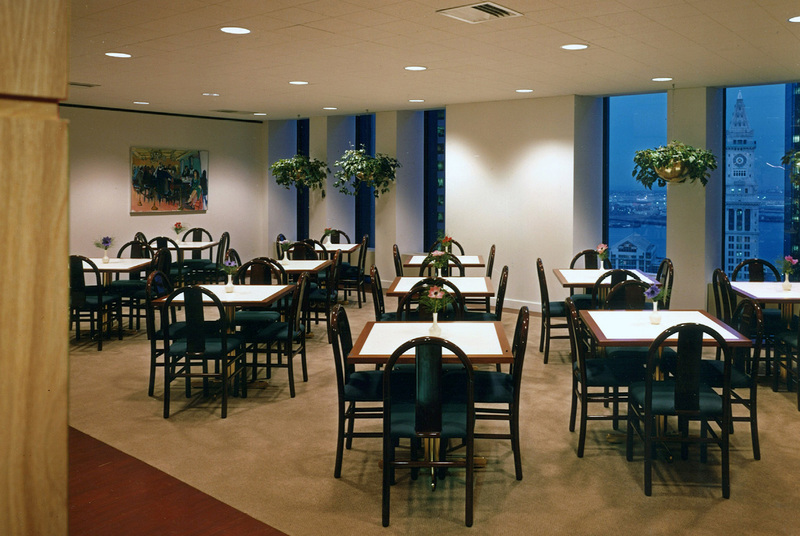 Although much smaller in scale, these café spaces were located to provide support for the conference center as well. 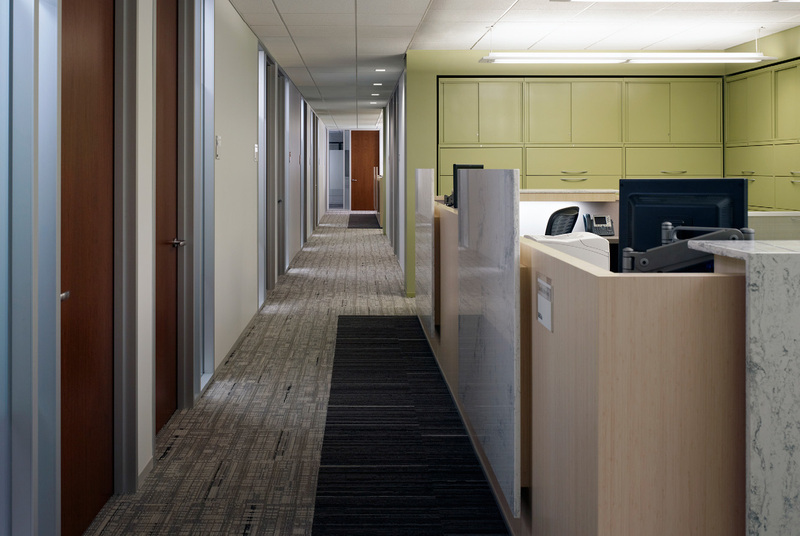 Shared natural light through the perimeter offices’ paired doors continued to benefit the interior spaces. Sustainability became more relevant with each design with the Chicago office attaining LEED Gold status, reflecting the sustainable commitment the firm now embraces. Each design maintains a modern character that represents the progressive approach the firm has brought to the legal profession. Chicago Secretarial stations showing the evolution of an idea that started with the original design in 1984. Manchester, NH lobby showing a modern design language and lighter woods. Manchester, NH dining space. Even the smaller offices are using the conference center/dining combination, originally developed for the Summer Street space in Boston. Long term relationships don’t work, the people in them do. By continually collaborating and challenging each other, we have pushed each other forward in our respective areas of professional services. Peter and Jon have transitioned their relationship to the next generation of leadership and we continue with work with Nixon Peabody today. By applying design thinking to the issues in law office evolution, we produced solutions that have withstood the test of time and the transitions in style. We are already imagining that the next office will need less overall space, have more collaborative space and be more sustainable. Our interiors group has grown over the years and in addition to supporting our architectural projects now constitutes a practice area active in the corporate real estate market.